Traveling can wreak havoc on your workout routine. Whether you’re on a long-haul flight, traveling between cities by train, or on a road trip, chances are you’re sitting in cramped quarters for long periods of time with little opportunity for movement. True, you may have a hotel gym waiting for you on the other end of your journey, but in the meantime your muscles can get stiff and your blood flow can change in unhealthy ways. The best thing you can do to offset the negative effects of being strapped in for hours at a time is walking, says Todd Galati, spokesman for the American Council on Exercise. But what about getting an honest to goodness workout on the go? Click here to see 12 exercises you can do anywhere. While stretching is a good way to get creaks out before you reach your destination, we wondered if it would be possible to do a bit more—maybe step out of that plane, train or car feeling a little better than when you stepped in. We reached out to certified master trainer Shaun Zetlin of Zetlin Fitness for some answers. “You can have a wonderful, functional and aesthetic workout while sitting stationary,” he said. While you’re not going to get a full sweat session in, you have a surprising array of options for toning, light strength training, and even a little cardio. Zetlin suggests a number of exercises that can be done with very little space and might even make you feel a little better about being crammed into coach for a few hours. “Packing light dumbbells on your trip is fantastic since you may perform a multitude of exercises for your upper body and core,” he added. If that’s impractical, you can substitute a small resistance band or even use a laptop bag or briefcase (where there’s space, of course). To give you a few more options, we supplemented Zetlin’s suggestions with a few of our own. 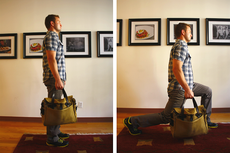 Take a look for 12 ways to work out on the go.